Not every critter has a real scientist to tell everyone about them, but I do! And he takes a mean portrait of me, too. Enjoy the article below, and you, too, can become a webworm expert. Most cavers notice the larger species of cave life that inhabit the caves they explore, such as bats, salamanders and pickerel frogs. Some animal inhabitants, however, are either too small to be readily seen, or they are hidden too well in their environment to be seen by any but the most observant caver. The fungus webworm is one of those animals that often escapes notice in caves. The fungus webworm is most often seen as a worm-like animal gliding along a silken thread that is very similar to the strands that make up a spider's web. 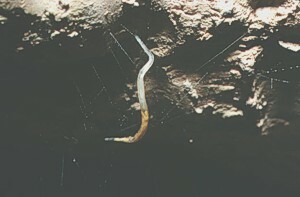 Some cavers call this animal a "monorail worm" because of its appearance as it smoothly glides up and down its silken track. The webworm is actually an immature stage in the life cycle of a rather nondescript fly called a gnat (pronounced "nat"). The stage we see gliding on the thread is called a larva ("lar vah"). Webworm larvae ("lar vee") develop into adult flies that closely resemble a mosquito. These flies, however, lack the proboscis (a long, flexible snout or tubular organ used for sucking) that is used so effectively by mosquitoes. The fungus gnat or webworm was formally described by Johnson in 1922. He described it on the basis of specimens collected from mountain forests in New Hampshire and Massachusetts. Biologists know these unique insects by the scientific name Macrocera nobilis. The first larval specimens were found on webs constructed under the bark of dead trees or in the leaf litter on the ground. We now know that this webworm occurs from southeastern Canada to the southcentral states in the United States. Individual webworms found in the southern end of the species' range are found in caves. This species has been seen in many Missouri caves. Gardner (1986) reported the webworm from more than 50 caves from 18 different Missouri counties. It is probably much more widespread in caves than our records indicate. It could also be very common outside of caves but there is very little known about this species in Missouri. We would probably classify the Missouri species as a troglophile (a cave-loving organism). It isn't restricted to caves but can probably spend its entire life cycle in the cool, dark, humid cave environment. Vockeroth (1976) stated that there were over 100 different species of fungus gnats in the genus Macrocera, and that they were found all over the world. Not all species form webs like M. nobilis. However, some fungus gnats not in the same genus are very well known because of their ability to glow in the dark. The glowworms of New Zealand caves have luminous organs at the tip of their worm-like body that they can turn on and off (Borror, Triplehorn and Johnson, 1989). These animals (called Arachnocampa luminosa) spin webs from the ceilings of caves. I've seen a species of webworm in Belize caves that looks very similar to our M. nobilis. These larvae, however, supplement their basic web with several isolated "fishing lines" that hang down from the main web. These vertical lines were very noticeable in the webs that I observed, but it wasn't until I watched a recent National Geographic special on Belize caves that I saw the "fishing lines" in action. These larvae will actually "reel up" the strands that have caught insects and then feed on their prey. I haven't seen anything like that happening with the Missouri species. Adults: Adults have been seen year round in the entrance and twilight zones of caves, and mating at various times of the year. Although the flies are seen most often in the better lighted areas of the cave, it seems that eggs are always laid in the dark zone. The eggs are often placed in rooms and passages that contain guano deposits, accumulated leaf litter or organic debris. Eggs are not deposited directly in this material, but are placed on old webs (of webworm or spider origin) or on new webs constructed by the female fly. No one is certain how long the adult flies live, but it is thought that their life span is fairly short. Perhaps they live only long enough to mate and produce another generation and then they die. This often happens with other species of insects. I would assume that salamanders and frogs would eat these flies if they caught them, but we really don't know enough about the ecology of the webworm to know if they have any natural predators that regularly prey upon them. Larvae: Fungus gnat eggs hatch two or three weeks after being deposited. The tiny larvae are very mobile and often move comparatively large distances (ten feet or so) before finding suitable areas in which to construct their webs. Older webs are often used and extended. he web consists of a major strand supported by additional strands. Some major strands that are more than a meter long have been found. The larvae will secrete shiny droplets of a sticky material on their web strands. These secretions apparently attract the prey of the larvae. The larvae will feed on any small insect that becomes stuck to its web although the most usual prey are small flies. Gardner (1986) reported that the webworms often feed on mosquitoes in Missouri caves. I haven't been able to determine if the larvae are cannibalistic on adults of their own species. Peck and Russell (1976) report that small beetles have occasionally been seen in fungus worm webs in Missouri. Although I've seen this insect in many Missouri caves, most of the specimens I've personally observed have been in caves that are heavily used by bats. This probably makes sense when you consider that the larvae are feeding on small flies that are laying eggs in the guano deposits. The webworm webs are often seen under ledges and between cracks at the perimeter of guano piles. The webworm larvae seem to have the same ability as spiders to detect prey that have been trapped in their webs. No one has reported seeing M. nobilis attacking and killing their prey, but they have been seen spinning a loose "cocoon" around prey after it has died. The larvae are fairly transparent and if you look closely, you can see the outlines of their digestive tract and internal organs. The larvae will continue to grow and develop for nine to ten months before they enter a dormant stage called a pupa ("pew pah"). Pupal Stage: After the larvae reach a certain size, they suspend themselves in a hammock-like contraption and turn into the next stage called a pupa. This stage is similar to the cocoon stage of a butterfly. In the pupal stage they are no longer transparent or actively moving. It might appear to be a food item wrapped in web but if you look closely, you might notice the wing buds from which the adult wings will develop. Development within the pupal stage results in the production of the body shape we recognize as the adult fly. The pupal stage may last up to two weeks before the adult flies emerge. The fungus webworm Macrocera nobilis is a unique component of the Missouri cave biota (community of living organisms). I've mapped the distribution of this species in Missouri based on Gardner's 1986 publication. The distribution seems rather disjointed and scattered. I'm sure it is more widely distributed than our records show. Observant cavers might want to watch for this interesting organism. You can help us learn more about its distribution and abundance in Missouri by sending me a letter listing the caves (and counties) in which you have seen this species. For more information or to report webworm sites, write: Dr. David C. Ashley, Biology Dept., Missouri Western State College, St. Joseph, MO 64507. Borror, Donald J., Charles A. Triplehorn, and Norman F. Johnson. 1989. An introduction to the study of insects. Sixth edition. Saunders College Publishing, 875 p.
Gardner, James E. 1986. Invertebrate fauna from Missouri caves and springs. Conservation Commission of the State of Missouri, Jefferson City, MO 72 p.
Johnson, C. 1992. New genera and species of Diptera. Occasional Papers of the Boston Society of Natural History, 5: 21-26. Peck, Stewart B., and Donald R. Russell. 1976. Life history of the fungus gnat Macrocera nobilis in American caves (Diptera: Mycetophilidae). The Canadian Entomologist, 108: 1235-1241. Vockeroth, J. R. 1976. The species of the Macrocera nobilis group in the Holarctic Region (Diptera: Mycetophilidae) . The Canadian Entomologist, 108: 1229-1233. 2003 Jo Schaper and David Ashley respectively.